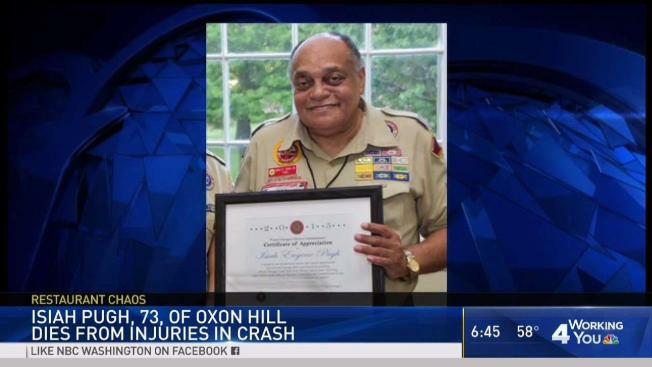 A Boy Scout leader who was injured when a car crashed into a Maryland restaurant at lunchtime last week died Tuesday afternoon, according to the National Capital Area Council of the Boy Scouts of America. Isiah "Gene" Pugh, 73, is being remembered as a remarkable man. He was commissioner for the Boy Scouts' Patuxent District, guiding some 3,000 scouts and adult leaders in Prince George's County and Charles County. "He held every leadership position we had and got our highest awards, and he was dedicated to the cause," said Judge C. Philip Nichols, Patuxent District chair. "He understood what learning for life was all about, and he lived it." The Boy Scouts of America’s National Capital Area Council remembered Pugh as a "well-respected leader" and "true friend" in a tribute published on their Facebook page. "His was a life well-lived, and we here are all the better for having known him," said Carlos Salazar, the senior district executive from the Patuxent District. Nichols was sitting next to Pugh at a meeting at Babes Boys Tavern @ Top of the Hill in Upper Marlboro about 1 p.m. Oct. 24 when a light-colored sedan smashed through the side of the restaurant, where dozens of people were having lunch. "I was about 18 inches from the car," Nichols said. "Isaiah fell on me. We both fell on the floor. Chairs went down. There was a table on top of us which the police officers had to take off of us. I couldn't get Isaiah off of me because he was unconscious at that point." Pugh was rushed to a hospital, but he did not survive. Police said the driver of the sedan was heading south on Old Crain Highway and attempted to make a left on Marlboro Pike but lost control. The driver of the sedan told News4's Tracee Wilkins her brakes went out. "I panicked," she said. "That's how I ended up over that hump right there." 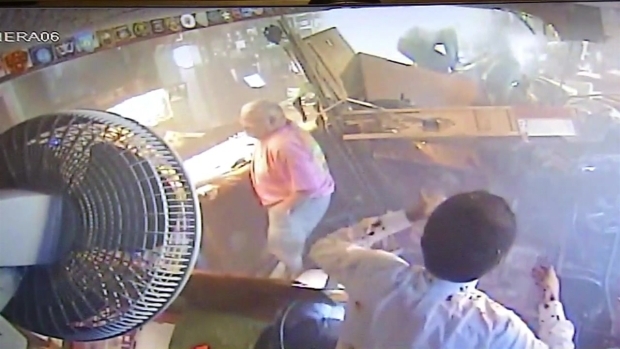 The car apparently slammed into the restaurant "at a fairly high rate of speed," Brady said. Police said it was still too early to discuss potential charges against the driver.